Whether you’re looking for them or not, your soulmate is out there. Most of the time, we meet this other individual when we aren’t even looking for them. It’s almost a natural search we take part in without even realizing it, and the feeling is indescribable when the search is finally over. It doesn’t have to be a romantic relationship, it could be anyone who seems to understand your very being. Friend or significant other, things start to change when you meet this person, and it’s evident through our behavior. 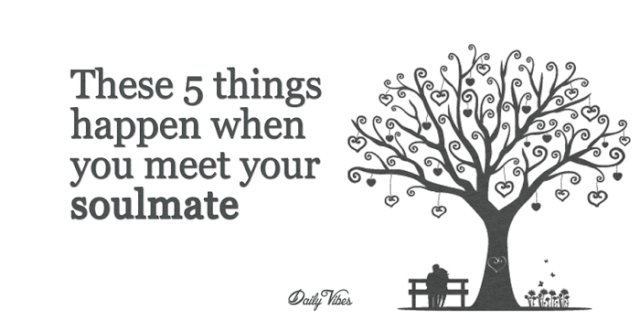 Here are the five things that happen when you finally meet your soulmate. Although it sounds cliché, when you meet your soulmate the world starts to seem more positive. Roses don’t start blooming out of the ground where you’ve stepped or anything, but they might as well have. Everything to you seems to be better than it was before, and you have a noticeably more optimistic outlook on life. This also changes the way you interact with other people. It seems counterintuitive at first, but even when you aren’t around your soulmate you’re smiling. There could be a gulf between the two of you at the time, but it wouldn’t matter, just thinking about them will make you happy. Getting a call or a text message from them could make your day, and it’s something you’ll be waiting for. The people around you might think you’re weird, just smiling at your phone, but it won’t bother you. When you meet your soulmate, you starting trying new activities and hobbies. Simply put, you want to be a part of their life in any way that you can. This means you’re going to start trying out the things that they enjoy doing on a regular basis. This isn’t a one-way street; they’ll want to try the things you like to do as well. This won’t be one of those relationships where you have to work to do things together. When you find your soulmate, you’ll also find that all of your relationships seem to have improved. This has everything to do with how your behavior has changed due to your new relationship. You’ll be more loving, forgiving, and accepting of the people around you, which can only have a positive impact on your other relationships. Essentially, you’re less selfish when it comes to other people. After meeting your soulmate, you’ll find that you’re going out of your way to make them happy. People who haven’t found this person yet usually complain about having to do something for somebody else, but you’ll find that going out of your way is something that starts naturally occurring. It won’t bother you to pick up their favorite food, surprise them with a gift, or work harder in order to take some extra time to spend together. I completely agree with you. This was with me when I met Bella. Thanks to video chat https://coomeet.com/ I met my soul mate. It was not easy to choose the only one girl, among so many beautiful ladies. But she found me, she wrote first, like hello, how you doing? And my world was painted in different colors of happines. Today I'm happy that I've met her. We talk every evening, I hope for our soon meeting. She said that she was going to go on a trip soon and possibly will visit me.